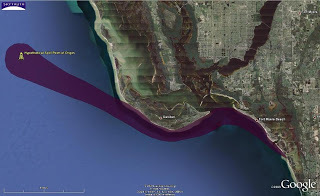 Should we pursue offshore drilling in new areas like the Florida coast? It’s a balancing act all right – good jobs and a partial reduction in our dependence on foreign oil (dang those Canadians!) vs. the potential damage to beaches, water and air quality, and tourism- or fishing-based economies. Stuff happens. Remember waaay back to 2005, when 9 million gallons of oil spilled from oil and gas facilities (including over 700,000 gallons spilled offshore) damaged by monster hurricanes Katrina and Rita? Stuff keeps on happening. 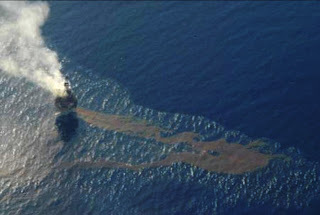 Despite new requirements that were intended to storm-proof offshore operations, there were additional spills and lost drilling rigs in the wake of the decidedly average hurricanes Gustav and Ike in 2008. Stuff gets old and breaks. 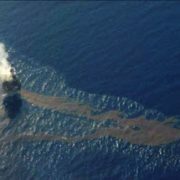 On July 25, 2009, over 63,000 gallons of oil leaked from a 20″ diameter pipeline on the seafloor about 30 miles off the coast of Louisiana, creating a slick that covered 80 square miles before Coast Guard responders could contain it. Nobody knows yet why this break occurred, but this older pipeline, built in 1976, had just begun to carry a lot of additional oil coming from a new platform farther offshore. In a common industry practice, Chevron didn’t build a new pipeline from their multi-billion-dollar Tahiti platform all the way to land; instead, they “tied it in” to the existing pipeline network, thousands of miles of metal pipe that in some places is more than 30 years old. Danged stuff. Right now Australia is dealing with a continuing oil spill off their northwest coast with no end in sight, that began last week when a nearly brand-new drill rig, the West Atlas, ran into an as-yet unexplained problem while drilling a new well, leading to a loss of well control that forced evacuation of the rig and is continuously spewing oil and gas. There’s a serious risk this rig could explode before they get the well under control, which will take at least 7-8 weeks. Stay tuned. Who pays? Pipeline and oil companies are actually cutting back on the insurance coverage for their offshore operations. Visuals help shed some light on the risks. Based on the Eugene Island Pipeline spill and resulting oil slick, we’ve created illustrations showing two hypothetical oil spills: one occurring from a point ten miles off the coast of Florida, and another occurring from the vicinity of Platform Irene off the coast of California (where a similar pipeline spill — the Torch spill — actually happened in 1997, oiling the beaches and killing over 700 birds). These are just illustrations that don’t take into account local wind and current, but they do accurately represent the actual size of the Eugene Island slick.